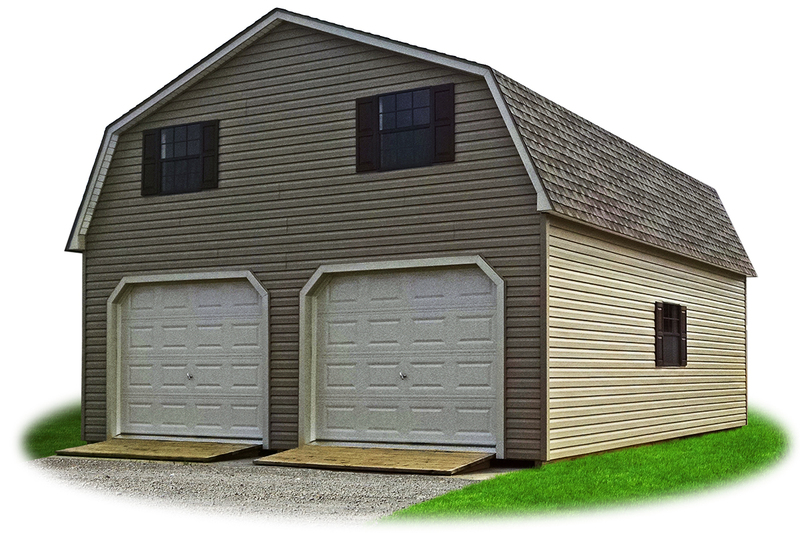 Pine Creek Structures now offers an affordable solution for customers needing a larger garage! 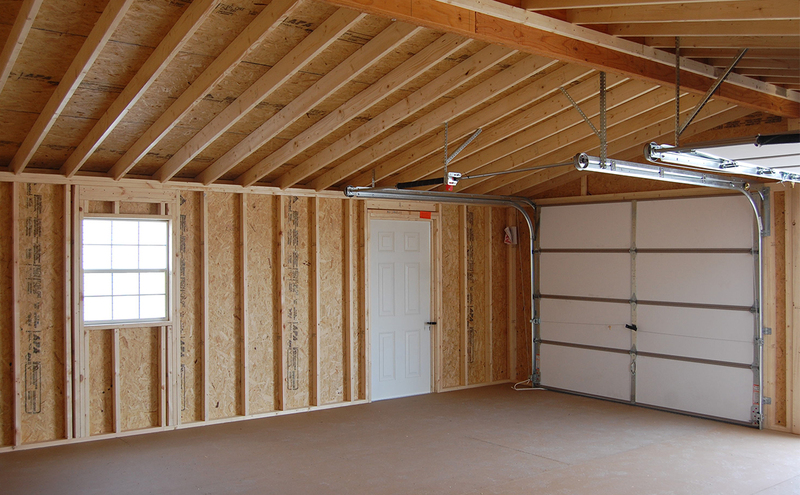 On the day of delivery, your garage will arrive in two sections and assembly will be finished on site. 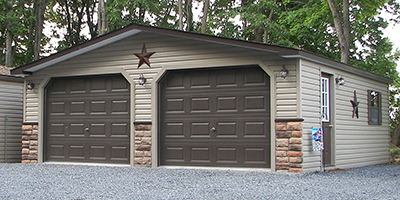 Our Two-Car Modular Garages range in standard sizes from 20x24 up to 24x40. Available with 50-Year LP Smart Side or Lifetime Vinyl Siding in a variety of colors. Choose a shingle or metal roof (in a variety of colors) for no added charge. Rent To Own is not available on modular units, but we offer two financing programs (with approved credit)! Learn about our financing programs here. Shown with clay vinyl siding, white trim and shutters, sandstone garage doors, clay fiberglass single entry door, and weatherwood shingle roof. Ramps available for additional charge. Shown with clay LP Smart Side siding, brown trim and shutters, brown garage doors, and shakewood shingle roof. Ramps available for additional charge. You choose the colors, entry door placement, and window placement! We also have a wide variety of additional options and upgrades available. We can even add a second story! If your structure needs to meet any HOA or township regulations, talk to your local store manager for help designing the right garage for you. Shown with warm sandalwood vinyl siding, classic sand trim, black shutters, white doors, and bronze metal roof. Also shown with additional options such as 9-lite house door, insulated windows, and colonial garage doors with windows. Structure built with no floor and placed on monolithic foundation. Shown with artisan clay vinyl siding, dark brown trim and shutters, brown garage doors, and barkwood shingle roof. Also shown with additional options such as 9-lite house door, outside custom sconces, electric, and stone front. Shown with clay LP Smart Side siding, bronze trim and shutters, sandstone garage doors, and bronze metal roof. Also shown with additional options such as colonial style garage doors with windows, additional windows, double door with transom windows, roundtop trim at windows, second story, and 8/12 pitch roof. Shown with clay lifetime vinyl siding, white trim, white garage doors, brown shutters, and weatherwood lifetime shingle roof. Also shown with additional options such as ramps, additional windows, second story, and gambrel style roof. 8. All structural components are fastened with nails. All exterior nails are galvanized to ensure no rust spots on the exterior of the building. *Modular Garages over 24” long will include additional posts along the center of the building for structural support. For placement specifications, talk to your local store manager. Complete on-site construction is available for sites with limited access. 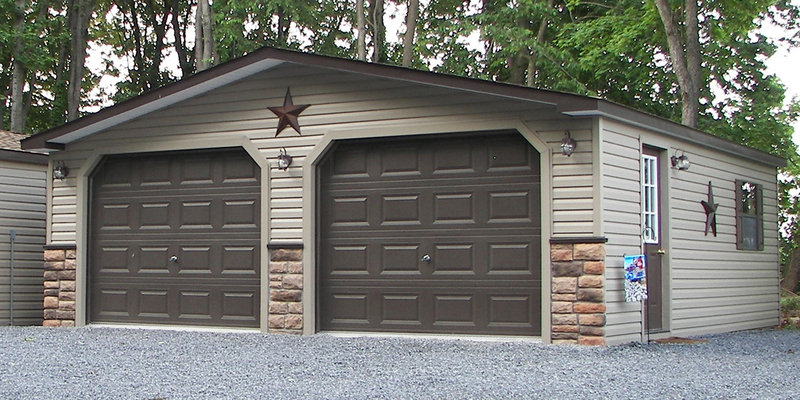 2-Car Modular Garages are also available without a floor (for installation on a concrete pad). Additional fees may apply. Should your township, state, or HOA require structural modifications to our standard construction specifications, additional charges may apply. 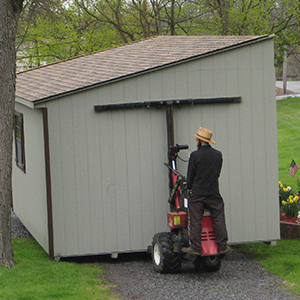 "Thank you for the outstanding craftsmanship and installation of our new two-car tractor shed! In specific, I wish to thank your staff for their courteous assistance, from the decision-making and ordering phase, and through the completed shed structure installation and follow-up communication... Many thanks to the entire Pine Creek team!" "Very pleased with the two-car garage. [The delivery and installation team] were very good at delivering the garage and placing it on the pad. It was completed in one day! What made me buy this two-car garage was the quality construction and dedication to customer satisfaction that was made evident by the courteous staff at Pine Creek. I would highly recommend Pine Creek Structures to anyone." -- John and Linda A. 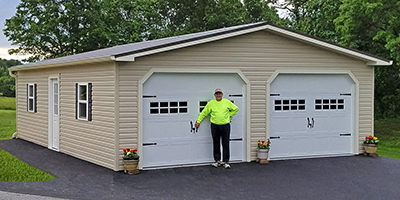 "We recently had a 24 X 24 foot garage installed by Pine Creek Structures... We did not know what to expect but were very pleased with the outcome. They were very professional and fast... 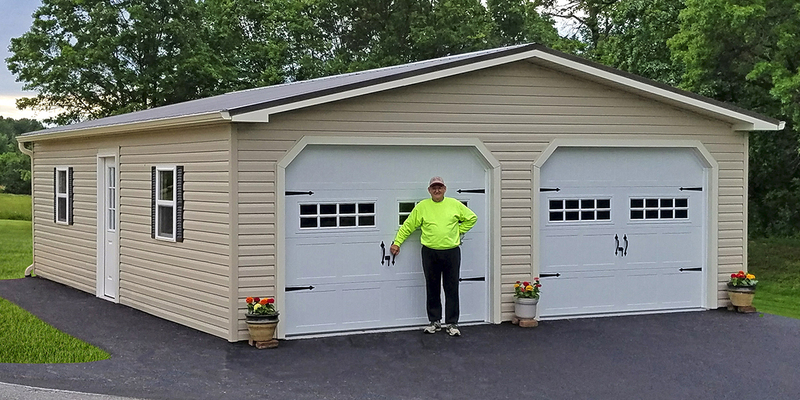 The Pine Creek Structures garage was installed quickly and without problems. We would be more than happy to recommend both companies [site preparation completed by Mignanelli Construction, LLC] to anyone who needs a garage." On the day of delivery, your two-car modular garage will be delivered in two pieces. Each piece will be carefully set in place. Our team will then finish assembly on site (typically 3-5 hours). 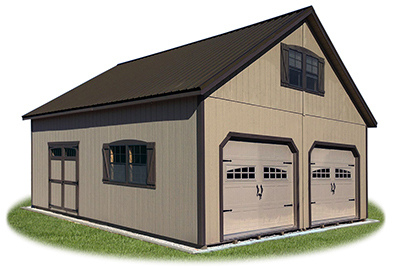 When ordering your two-car modular garage, talk to your local store manager about site prep requirements. Modular units require specific site preperation in order to have a successfull delivery and final assembly.